In this chapter, I offer a critical genealogy of Islamic political philosophy and the development of Islamic political thought from the age of the rightly guided caliphs to the contemporary Arab Spring. I look at key classical thinkers like Al-Mawardi, Al-Farabi, Ibn Taymiyyah and Ibn Khaldun and important contemporary thinkers such as Syed Qutb, Maududi, Khomeini and Al-Nabbhani. This chapter concludes with a critique of Islamic political thought for privileging identity and power, structure and law and ignoring governing process and the mystical dimensions of Islam. In this chapter, I also explore the Islamic conception of democracy as advanced by several contemporary theorists. 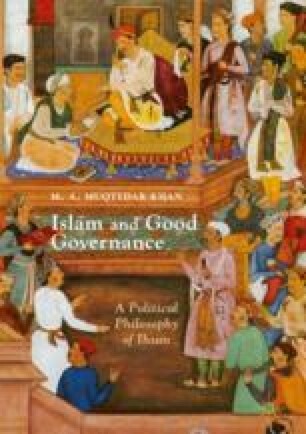 This chapter includes a review of Sufi understanding of politics and argues that the preliminary ideas advanced by Sufi thinkers like Saa’di indicate the potential to develop a political philosophy based on the concept of Ihsan, specially the mystical understanding of Ihsan. This chapter exposes the diversity of approaches to Islamic political thought in order to emphasize that the Shariah-based approach to politics is only one Islamic way of thinking about politics. There are many.